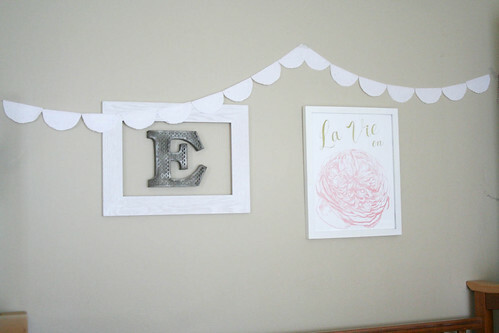 I recently re-used my stack of doily banners from Eisley's first birthday to decorate for her second birthday. After taking them down once again, I couldn't bear to put them all away. 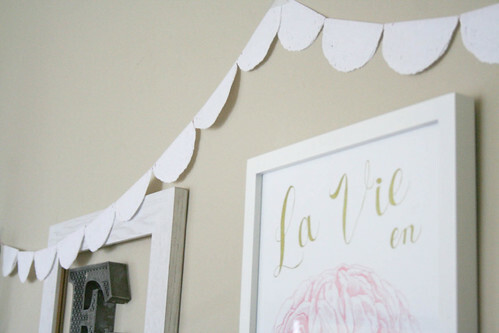 For some reason, doily banners complete me. Or they had me at hello. Or some sort of ill-fitting Jerry Maguire reference. Anyway, I strung one lone banner in a (hopefully charming) lopsided fashion, above her crib in our room. I have every intention of creating a fancy photo-and-frame collage on this wall at some point in the near (or far) future, but for now I feel like this spruces up the area at least a little bit. Come Christmas time, I'm totally going to string up some twinkle lights, too. Don't even get me started on the twinkle lights. They are my happy place. Every now and again, people ask us how it works—the whole sharing-a-room-with-a-toddler thing. I have actually been pleasantly surprised by how normal the whole thing feels. It doesn't make me feel like we've lost our own space, like we're being forced to share a room, or awkward and unusual in any way. I always dreamed of decorating a nursery for my first child, but, as it turns out, things don't always end up the way you planned. Instead of a house with a white picket fence, we have a cozy duplex on the corner of a fairly busy street. Instead of three bedrooms, we have one. And that's the way it is. And that's what has (somewhat unsurprisingly) worked out perfectly, in its own way. I know of at least two other married couples who have done the same thing with their first child—sharing a bedroom out of necessity. I love when I discover other people who are making it work in small spaces, because sometimes I do slip into that mentality of, This isn't fair! How come everyone else gets to have a nice home with extra rooms? I deserve this, I deserve that, poor ol' me. Some of that is just selfishness and human nature at its best, but I know that much of it comes from feeling quite alone in our situation. Everywhere I look I'm surrounded by images and words and messages of how things should be, and what I should want things to be, and what normal is, and it's not always my reality. So, when I meet someone else who manages to get by on less, with a smaller space, it is like a breath of fresh air. Is it weird that I love watching the season of Friends where Rachel has Emma, especially because never once does Emma have her own nursery? How often do you see that on TV or in movies, not to mention on blogs or in magazines? Someday we will have more, and down the road Eisley (and any other children that hopefully come along some day) will have more stuff and more room to roam and more walls to destroy with colored pencils. But I hold tightly to the idea that we will always look back on this time of our lives and almost miss the simplicity and close quarters. As always, I'm trying to remember to just live in the moment and stop trying to focus on everything I dream of happening someday, someday, someday. 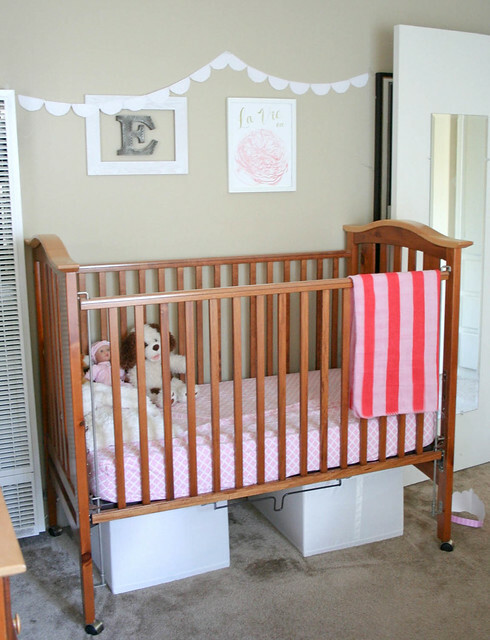 I have a 4 bedroom house and yet I'm jealous of your bedroom that's even large enough for a crib. Ours are so teeny/tiny that a crib wouldn't even fit! Sometimes I think it'd just be better to have one giant open floor plan. No walls. Except for the bathroom because that's just gross. haha! The older I get, the less I'm sure that I want a big house. I probably won't have a choice, since it's quite important to my significant other that we have our own walls and a big yard and a space to entertain and all that. But right now I'm quite happy in our two-bedroom condo (where I don't have to do any yardwork, and a full vacuum takes about 30 min). We live in less than a thousand square feet with our four sons. It is not ideal, I guess, but I don't often wish for more. The only times I really lose my contentment with our current home is when someone tells me, "you are going to need to get a bigger house!" But to be honest, I adore our little home and that we get to live so closely to one another. Eventually, yes, we will probably have to move as they become physically bigger people, but for now, I am super happy where we are! So be encouraged... You are not alone! On the plus side less space = less cleaning! We don't have a big house but I still spend more time than I would prefer cleaning it. I'm quite happy with my little home, I just wish it was closer to my family. I think it's very hard not to wish for more / better especially with all the images on social media these days. Your blog gives me the 'wanties' your home looks so homely and well decorated in your pics! I think you've done a lovely job with what you have! Plus living in a smaller space makes your family relationships strong and closer. I think your place looks super cute! Ack! mind-connection overload. Yes. ALL OF THIS. Sometimes I am broken hearted that my boys don't have a yard. Baby G shares our room and O has his own. I think I lament about rooms/nurseries/space/yard because I grew up in the suburbs.